OMG!!! You guys did it and showed the world who has truly the BEST fans on earth. The award for “BEST FAN ARMY” at this year’s MTV O Music Award Ceremony goes to…Tokio Hotel’s Aliens 😉 Thanks for this giant support! The celebration of the brand new MTV O Music Award show took place in Las Vegas, US yesterday night. 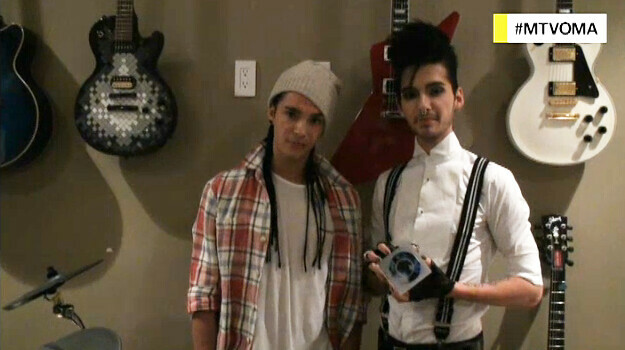 The four rock stars of Tokio Hotel from Germany received an award in the category “Fan Army”. Tokio Hotel were the only European act that scored one of the prestigious trophies. The Kaulitz Brothers behind bars, Smeared in blood and put in heavy chains. A fight or what happened? Jasmin Ratioro with the pictures and the answers. What are Bill and Tom Kaulitz are doing there? Handcuffs, collars, hello? Are Tokio Hotel on the SM-trip? Wrong, this is a photo-shoot for animals-right-group Peta. Bill: Tom and I are vegetarians, but above all we don’t want animals to be tortured or for animals to live in a circus and be responsible for the amusement of people. Like animals in a cage, that’s how the Kaulitz-Brother should have felt the same. The permanent fear of crazy stalkergangs, is one reason, why they left Germany and moved now to the US. For months they were followed by fantatical fans and were even threatend. Tom: There were people, who were extremly, yeah, disfunctional. Who have extreme problems with their own life and of course they need help. But now, Tokio Hotel scream for help because of a different reason. No, Bill is not hungry, although he became very thin. The Twins are fighting with this action for species-appropriated keeping of animals. Bill: An animal doesn’t get it, it’s just caged and I couldn’t stand it. If I think about it, I am at once in tears. But this may put a smile on Bill’s face, that he has just been chosen to the sexiest vegeatrian 2010. It looks like prison, but it is Peta. The Tokio Hotel Twins Bill and Tom Kaulitz are committed to the new campaign of the animal rights group Peta, against animals performing in circuses which are very often, as in this photo, put in chains. But one second please, isn’t it usal, that Peta-models are naked? Maybe next time, as long both vegeterians are so young und fit.